Those embroidered/embellished Altuzarra sweaters are beautiful! 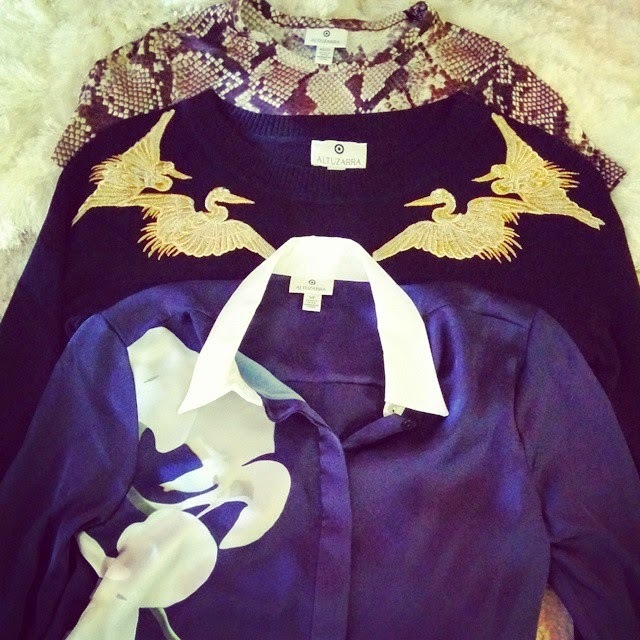 I love all of them - especially that gorgeous sweater with the emboidered gold pelicans/cranes on it. The silky and lustrous looking purple dress shirt with white collar and cuffs and bird print on one side is very attractive, and the fabric looks like it must feel wonderful. The silver reptile print T-shirt and matching skirt are pretty. I love your Altuzarra for Target Haul! - YouTube video. It sounds like you went on quite an odyssey shopping at the three Target stores. Great haul!